THE TALE OF THE TWO DONKEY-OWNERS. Two men met each other on the road; and each of them had a donkey. Then the men greeted each other: the donkeys, also, putting their mouths together sniffed at each other. And the one man asked his fellow saying : “We have greeted each other. Why have the donkeys also put their heads together?” The other man answered him: “Doest thou not know this? The donkeys have sent a strong donkey to the Lord to enter their plaint before him, that is to say, that the Lord should free them from under [the tyranny] of men. Now they ask each other saying: ‘Has the messenger-donkey returned or not’?” And it is said that all donkeys ask each other about this matter putting their mouths together. By this tale it is seen that every creature longs for liberty. THE TALE OF THE OX, THE SHEEP, THE CHICKEN AND THE DONKEY. The fox, then, led the hyaenas to them thinking: “Now they shall perish.” When the hyaenas came to the four animals they said unto the chicken: “Come to us, that we may hold a council!” But the chicken answered: “Let one hyaena with a load of grass upon his back come to me that I may ride upon him and come to you!” And then he said to his company: “After I shall have mounted the hyaena loaded with grass, when I say to you: ‘Give me a whip’, then give me a burning piece of wood!” And when they had brought him, the chicken mounted the hyaena loaded with grass. And he said to his company: ‘Give me a whip’; and they gave him the burning wood. And he flew away after having put the kindling wood into the grass. The hyaena, when the grass upon his back took fire, ran to his company; but his company fled from him. In this way all the hyaenas fled from them. Thereupon the chicken said to his company: “Let us go home! The ox shall join the cattle, the sheep the sheep, the donkey the donkeys: let each one of you thus join his company. But I shall gather the droppings of roast corn in my Kabasa 1 ).” And for this reason the chickens became plentiful in the land of Kabasa and live there until the present day. [This is what] they say. THE TALE OF THE BOAR, THE FOX AND THE MAN. Once when a man was gathering brush-wood at the bank of a river, a serpent jumped upon him. And beginning at his feet he coiled himself around him up to his head. The man, then, said to the serpent: “Go down from me!” But the serpent refused. Then the man sought to kill him, but he found no means of killing him. And while they were in this state, the fox came to them; and the man said to the fox: “This serpent has coiled himself around me, and when I told him to go down he refused, and he wishes to kill me.” The fox said to the serpent: “Go down from him; be friends!” And the serpent unrolling himself went down from him to his feet. Then the fox said to the man in a proverb: “Thy serpent is [now] under thee, Thy staff is in thy hand [now, see! ].” That is to say, he told him by this hint: “With the staff in thy hand kill him, after he has got under thy feet.” And the man taking the hint killed the serpent with his staff. Thereupon said the man to the fox: “Thou hast done a good thing to me; I shall also reward thee with a good turn. Wait for me in this place, that I bring thee a kid”. THE TALE OF THE COUNCIL OF THE MICE. The old enemy of the mice is the cat. Therefore, once upon a time, the mice held a council. When they all were together, they deliberated in this manner: “We perish through the cat. What shall we do ?” And some of them answered: “Let us tie a bell on the cat. And when she comes to kill us, we shall hear the sound of her bell and escape from her.” And all the mice said: “This plan is a good one; let us do this that we escape from her!” And after they had thus finished their council, they went home. The grandfather of the mice had stayed at home; now he asked them: “My children, what have you resolved?” And they said to him: “We all have resolved to tie a bell on the cat, and when she comes near us, to escape from her, because we shall hear the bell.” And he said to them: “Ye have planned well, my children ; but which then of you is it that will tie the bell on the cat?” And all the mice were frightened and said: “That is true! Who is to catch her for us?” Thus their council came to naught. This is just a short excerpt from the book. Please click here to read the full version of “Princeton Expedition to Abyssinia”. The collections of the Victoria and Albert Museum include a number of Ethiopian objects and images. Many of these are associated with a British military expedition undertaken to Ethiopia (then known as Abyssinia) in 1867-68, which ended with the ransacking of the Ethiopian Emperor’s fortress at Magdala. Not all of the objects, however, are straightforward products of plunder. Indeed, the stories behind the acquisition of the photographs, textiles, jewellery, religious and other artefacts held by the V&A reveal a complex web of people, places and politics brought together by conflict. This article presents the stories which lie behind some of these objects and contrasts the personal experiences of those caught up in the conflict with the way in which the ‘Abyssinian Expedition’ was presented to the British public. This article highlights just some of the objects and images associated with the Expedition which can be found in the V&A’s collections. The Ethiopian Prince Alamayou was one of the casualties of the conflict. He is pictured, aged seven, in a photograph taken by Julia Margaret Cameron after he had been brought to England following the death of his parents. Alamayou’s sad story was reported in the British press and attracted the sympathy of many, including Queen Victoria who arranged for the state funding of his education. He was popularly cast as a romantic and melancholy figure, as is apparent in Cameron’s photograph. Alamayou’s death of pleurisy at the age of 18 was described by the Queen as ‘too sad’. His image appears in four places in the V&A’s collections; in the Cameron photograph, on two cartes de visite and in a photograph pasted into a family album. Alamayou’s guardian in England was a British army officer and colonial official, Captain Tristram Charles Sawyer Speedy. Speedy was well-acquainted with the Prince’s homeland having travelled to Ethiopia in 1860 to assist his father, the Emperor Tewodros II (Theodore), with military training. Whilst there Speedy developed a strong affinity with the Ethiopian people; he learned to speak Amharic and adopted native dress. In 1868 he returned to serve as civilian interpreter to the British expedition. Back in England, the six foot five, red haired and bearded Captain made an unlikely but affectionate guardian figure to the slight Prince. Speedy appears in a photograph by Cameron in the V&A’s collections. 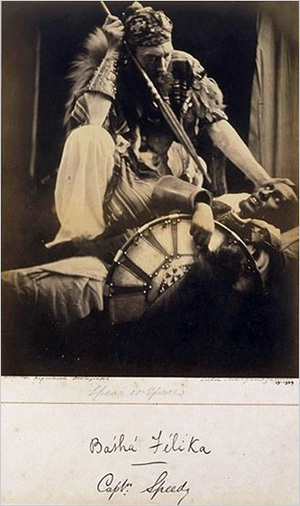 Wearing Ethiopian dress, he stands over a reclined unidentified African man, with a spear in his hand, apparently playing out a fantasy of conquest (the photograph has been titled ‘Spear or spare’). The mount carries the handwritten caption ‘Báshá Félíka’ meaning ’speedy’; the Amharic name given to Speedy by Tewodros. Speedy’s relationship with the Ethiopian people is also reflected in a small collection of objects given to the Museum by his goddaughter in 1936. Unfortunately the stories behind how he acquired the engraved silver and iron handcrosses, silver anklets, hairpin and ornament have not been recorded although it is possible the objects may have royal connections. Further items formerly in the collection of Speedy are held by the British Museum. Speedy was not the only European to make the acquaintance of the Ethiopian Emperor. In the years before the Expedition Tewodros had been an admirer of Europe and its technologies, particularly those used in the manufacture of arms. He had formed close associations with the British traveller John Bell, who visited Ethiopia in the early 1840s, and Walter Plowden, the first British consul to Ethiopia, who arrived in 1848. However, by the 1860s Tewodros had become frustrated by a lack of support from Europe for his campaigns against Turkish expansion on the Red Coast. In 1864, in an attempt to prompt the British and French governments into action, he took a number of Europeans hostage including the second British consul, Captain Cameron. Queen Victoria sent a letter to Tewodros seeking their release but her envoy, the civil servant Hormuzd Rassam, was also captured. Following parliamentary debate, Britain began to plan a punitive military expedition. Under the leadership of General Sir Robert Napier, in 1868 the expedition marched to Tewodros’s fortress at Maqdala and a brief battle took place nearby. Britain won the conflict, but not before the captives were released and Tewodros himself had committed suicide. Tewodros’s suicide on the eve of the storming of his fortress left a widow, Queen Woyzaro Terunesh. She requested that her son, Prince Alamayou, and she be escorted by British forces to her native province of Semyen, in northwest Tigray. However, as the party reached Haiq Hallet on 15 May 1868, the Queen died, apparently of lung disease. A report in the British press described ‘Her funeral [which] took place next morning in the great church at Chelicut … The women of her household, showing her robe, her ornaments, her slippers and her drinking cup, beat their breasts, tore their hair, and scratched their cheeks, shedding tears of real grief as they bewailed her death’ (Illustrated London News, 1868). The Queen’s possessions, which were listed by the British political agent at Aden (Yemen), were sent on by ship to the Secretary of State for India at the India Office, London. They were given to the South Kensington Museum (later V&A) in 1869 and included two cotton robes lavishly embellished with silk embroidery; a shawl; silver bracelets, anklets and rings; two ‘amulet’ necklaces of leather, silver and amber and a silver hair pin with decorative finial. 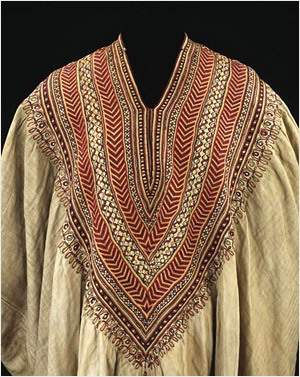 Woman’s dress formerly in the possession of Queen Woyzaro Terunesh, 1860s. The Queen’s possessions, the collection of Ethiopian objects formed by Captain Speedy and the photographs of Speedy and Prince Alamayou, provide a tangible link to people whose experiences of the conflict in Ethiopia strayed from the official narrative. In the British public sphere, however, these disparate experiences were written over by a unified and triumphant tale of conquest. The second part of this article reflects on the public presentation of the Abyssinian Expedition. Given the great complexity and expense of the Abyssinian Expedition, which involved more than 13,000 men, 30,000 animals and a journey of some 400 miles, it was necessary to engage the support of the British public. This was largely achieved through recounting a patriotic tale of a great imperial power overcoming a hostile territory and ‘barbarian potentate’. Significantly, the expedition was one of Britain’s earliest military operations to be captured via the relatively new science of photography. Two sets of photographic stores and equipment were sent from England by the Royal Engineers’ Establishment and used to record the landscapes, camp scenes and leading individuals associated with the expedition. The V&A’s collections include at least seven photographs taken by the Royal Engineers from a series of 78. Three of these are panoramas, painstakingly formed by pasting together three photographs. One records the expedition camp at Zoola (Zula). Taken from a high vantage point, it captures the huge amount of equipment and technology required for such an expedition. Feats of engineering were a particular focus for visual record and the Zoola image includes part of a British-built railway line which ran ten and a half miles inland. Another photograph in the series presents a view up the Sooroo Pass, or ‘Devil’s Staircase’ as the Assistant Field Engineer charged with forging a path through it, is said to have called it. It took four companies three months to construct a ten-foot-wide cart road up the pass. Images such as these were disseminated through official and unofficial reports, museum displays and the British press as evidence of Britain’s military and technological powers. The Illustrated London News published numerous engravings of the Expedition. Some were based on the Royal Engineers’ photographs, others on sketches made by the newspaper’s Special Artist in the field, William Simpson. The V&A holds two Ethiopian handcrosses which were donated to the Museum by Simpson’s wife following his death. Both carry the inscription ‘Abyssinian Cross 1868 William Simpson’ and presumably fulfilled a function somewhere between medal and souvenir. Military personnel involved in the Expedition were encouraged to make drawings and reports. On the orders of the Secretary of State for War, Major Trevenen James Holland wrote the only official account of the expedition with a military colleague, Sir Henry Montague Hozier. Record of the Expedition to Abyssinia was published in two volumes in 1870. Holland may be the vendor of several Ethiopian items to the South Kensington Museum in April 1869 including a pair of silver anklets, a ‘Galla’ (Oromo) necklace, a pair of earrings and two processional crosses. Following the defeat of Abyssinian troops, British forces entered the Magdala fortress with the aim of collecting anything of value to be later auctioned off to raise money for the troops. They were accompanied by Richard Holmes, an assistant in the department of manuscripts at the British Museum, who removed a number of objects - manuscripts, regalia, religious antiquities and other material - from the imperial treasury and from the Church of the Saviour of the World. Holmes also made a sketch of the face of the dead Ethiopian emperor, which was reproduced in the British press and in popular print formats such as carte de visite. A golden crown and chalice initially acquired by Holmes from a soldier were deposited with the South Kensington Museum by H.M. Treasury in 1872. Recent scholarship has suggested that they were commissioned by Empress Mentewwab for a church she founded in Gondar in 1740. Today these items can be seen on display at the Museum, in a gallery which highlights the role of precious vessels of gold and silver in religious rites and ceremonies. 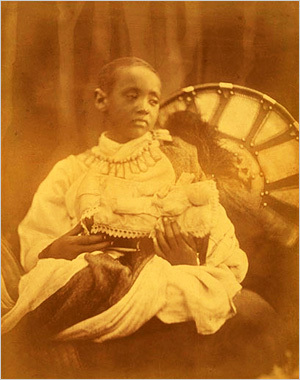 Today, the Abyssinian items are valued for their beauty, craft and religious significance but an 1868 display at the South Kensington Museum entitled ‘Abyssinian objects from the Emperor Theodore, Lent by the Queen, the Admiralty and others’ was clearly intended to celebrate an imperial conquest. No list of exhibits survives but an essayist in the Gentleman’s Magazine described the display as a ’show-case full of victorious trophies, “spolia opima” of our late enemy, his Majesty King Theodore’. Another noted the inclusion of a portrait of the dead Emperor’s head, presumably based on Holmes’ sketch. Even 20 years later a Guide to the South Kensington Museum noted that ‘vestments and garments’ on display had been ‘captured during the Abyssinian campaign under Lord Napier of Magdala’. The objects and images described in this article, then, have fulfilled many different functions - religious, ceremonial, decorative, documentary and political - and their current home at the V&A represents one stopping-off point on a turbulent historical journey. In the 21st century, as in the 19th, they make a conflict distant to us in time and place more tangible and immediate. The material also challenges the idea that the ‘Abyssinian Expedition’ was a clear-cut clash between ‘them’ and ‘us’ and provides an unsettling reminder of the imperial processes which enabled British museums to acquire the cultural assets of others. ADDIS ABABA, 9 February 2010 (PlusNews) - The whims of fashion collided with some of life’s harsher realities when, during a recent fashion show in the Ethiopian capital, Addis Ababa, condoms were the fabric of choice on the catwalk. At the Condom Clothes Fashion Show - held in January and organized by social marketing group DKT with the Zalef Fine Art and Fashion Design Institute - 10 spectacular dresses made exclusively from 10,000 male and female condoms of all colours, shapes and sizes were on show. 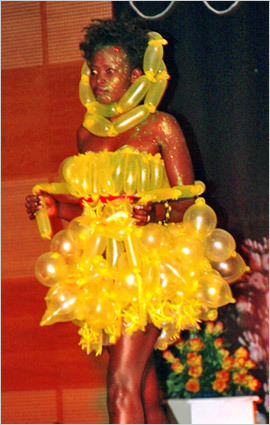 The latex garments were later modelled at a show - held under the theme, “Abstain, Be faithful and use Condoms” - at the Hilton Hotel in Ethiopia’s capital; there is also a plan for the event to be taken to Adama, a major regional city. The fashion initiative is the latest move by DKT to try to break the stigma associated with condom use in Ethiopia; in 2009, it set up a condom café in Addis, and ran a two-month campaign to distribute condoms and kerosene to house helps in the capital. An initiative mail from author Fitsame Teferra reached us about two months ago in which she asked us if we would like to read and give our comment on her new children’s book. Shortly after we expressed our enthusiasm, she sent us a copy of the book as she promised. The first positive impression of the book was the result of it’s colourful appearance and an image of a cute smiling kid bidding good night to all of us. Though I was still not confronted with her story, I couldn’t help expressing my first reaction by wishing Abeba a beautiful night full of happy dreams. “Abeba Goes to Bed” is a story about a small kid who is bidding good night to each member of her huge family before she goes to bed. The story is written in four languages simultaneously: Amharic, English, German and French. Firstly, I enjoyed reading the book because it reminded me of the typical childhood most of us had back home. And secondly, I enjoyed reading it to my three years old daughter because I saw from her shining eyes, how she liked the story. 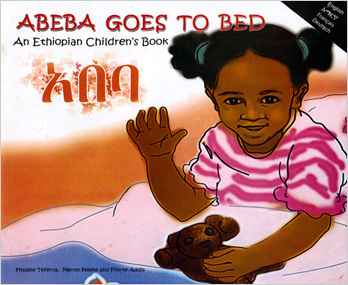 “Abeba Goes to Bed” was written with simple and understandable manner. 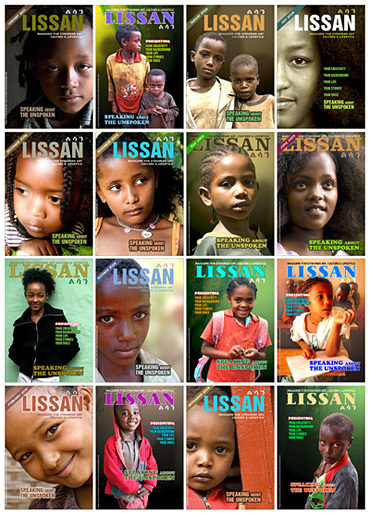 Most of Ethiopian readers will surely be reminded of their own childhood: a childhood that was part of a big family filled with many family members of different generations. This book helps us to transmit essential social values to our children. I want to recommend “Abeba Goes to Bed” to all parents, who want to show and teach their kids about the lifestyle of modern Ethiopian family which is still deeply attached to the older traditions. This book is also recommendable for foreigners who have adopted children from Ethiopia. It will be a great help for them to show their adoptive children the tradition of their birth place in simple and visual way.